This is a perfect book to read while relaxing out in the backyard on a lazy summer afternoon. Especially, if like me, you always wished you had been born a generation earlier and come of age in the 1940s. Author Marjorie Hart remembers her time in 1945 New York City as the best summer of her life. Since the city is recreated here as a place of wartime excitement, Broadway shows, sunbathing on Jones Beach and jitterbugging under the stars, readers can certainly understand why. Inspired by the example of fellow sorority sisters who land plum jobs at Lord & Taylor, Iowa college students Marjorie and Marty decide to travel to New York City and get exciting summer jobs too. It’s their first trip to New York, and not surprisingly they find once they arrive that it is indeed the city of their dreams. And why shouldn’t it be? This is a city where Nat King Cole plays at local nightclubs, Gene Krupa drums nightly at the Astor, and Walter Winchell reports on Café Society at the Stork Club. The Duchess of Windsor regularly shops for diamonds on Fifth Avenue and the sundaes at Schraffts are to die for. You can almost hear Gene Kelly and Frank Sinatra singing ‘New York, New York, What A Wonderful Town’ as they stride through the streets in On The Town -- which was set in exactly the same time period. Not only does the city seem as romantic as in the movies, but Marjorie and Marty are hired by Tiffany as soon as they arrive. Because of the war – and the absence of young men – Tiffany breaks with tradition, assigning the pretty blonde Midwesterners to act as couriers within the store. Their job is to transport jewelry pieces from the showroom to the custom jewel repair and shipping departments on the upper floors. The girls are thrilled of course, especially when they are outfitted in brand new Tiffany blue dresses from fashionable Bonwit Teller. Although their $20 weekly paycheck barely covers the rent on their Morningside Heights apartment, they learn to economize by eating at the famous Horn & Hardart Automat. And dinner dates with a handsome Navy midshipmen (who coincidentally resembles the young Jimmy Stewart) allow Marjorie to dine at a swanky sit-down restaurant once in a while. But the heart of the tale begins and ends in that elegant store on Fifth Avenue where the rich and famous walk through the doors daily (two such celebrities are Marlene Dietrich and the very young and just married Judy Garland). Another writer may have chosen to cast a critical eye at the sexist practices of Tiffany, where only men are permitted to work in sales. But Marjorie tells the story through the innocent and grateful eyes of a young girl who was thrilled to be given the chance to be a Tiffany courier. And the men who do work there are invariably gracious, kind and protective of them. Sorry, but this isn’t a 1940s version of Mad Men (which, btw, I love). The nostalgia and vivid recreation of another time and place is the same, but otherwise, the book could be termed Mad Men without the adultery, alcoholism and unhappiness. Although life in New York often appears sunny, every chapter or so, there is usually something to remind the reader that the war is still being waged. And both girls know too many people who have lost loved ones in battle. So when the end of the war is announced in Times Square on a hot summer night, our girls are smack in the middle of the throng, jubilant and relieved. In fact, Marjorie is witness to a number of newsworthy events that summer, such as the Fifth Avenue parade for Eisenhower and the shocking crash of a B-25 Army bomber into the Empire State Building. Although the book is light in tone, don’t mistake the young women at its center as silly and superficial. Marty majored in finance and went on to work for the largest bank in the U.S. Marjorie earned a PhD in music, performed with the symphony as a cellist, and later taught music at the University of San Diego. During her summer at Tiffany, Marjorie is even offered one of Yale University’s first music scholarships for women. So sit back with a tall glass of iced tea, and enter a gentler world where women wore white shantung jackets, people had never heard of cheesecake (only to swoon once they tasted it), girls spritzed Evening of Paris perfume over their hair and young men asked you to wear their college pin. There’s even a lovely coda. Both women went on to have happy marriages and satisfying professional lives (once the children were grown). Old-fashioned maybe. But it looks an awful lot like happiness to me. 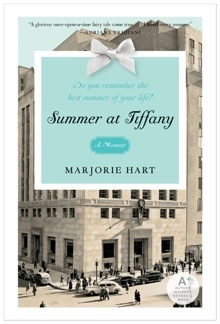 Spend a Tiffany summer with the author and you may very well agree. I have little objectivity where Tina Fey is concerned. Her nine years as writer – and later first female head writer – of Saturday Night Live produced the best years of SNL since the early glory days of Murray, Belushi and Radner. And 30 Rock (which Fey produces, writes and stars in) just finished off yet another great season. A few more comedy achievements like this, and I’ll put Fey up there with Lucy. But back to the matter at hand. Bossypants is Fey’s comic turn through her childhood, her years at Chicago Improv, SNL, and 30 Rock, the white hot attention brought to her SNL appearance as Sarah Palin…and everything in between. This includes motherhood, her honeymoon aboard a cruise ship to the Bahamas that unfortunately catches on fire, and excerpts from comedy scripts. Along the way, she’ll talk about being too skinny, too fat, too nerdy, too sarcastic, too exhausted, and sometimes too bossy. Babies: "Sleep when your baby sleeps. Everyone knows this classic tip, but I say why stop there? Scream when your baby screams. Take Benadryl when your baby takes Benadryl. And walk around pantless when your baby walks around pantless." Skin Care: "The Three Secrets of Great Skin are Moisture, SOOTS (Stay Out of the Sun), and Be Italian." Fine Food: "We dined at Red Lobster. There is no one of woman-born who does not like Red Lobster cheddar biscuits. Anyone who claims otherwise is a liar and a Socialist." Fashion: "Now, I'm not really one for status symbols. I went to public school. I have all my original teeth and face parts. When left to my own devices, I dress like I'm here to service your aquarium." Korean nail salons: "It would be a great exercise for someone who thinks they want to move to New York. Sit in an enclosed space full of fumes and hold hands with a stranger for twenty minutes while everyone around you speaks a language you don't understand. If you enjoy this, you will enjoy the 6 train." Don’t expect shocking revelations, or tales of suffering, (unless you count all the unfortunate hairdos Fey went through from the time she was a child, all proudly on display in family photos). Like fellow comic essayist Nora Ephron, Fey sees everything as grist for the humor mill. Luckily she’s as witty and engagingly self-deprecating as Ephron is too. One can only hope that she will be just as prolific, and that the entertaining Bossypants is the first of many books by Tina Fey. Anyone who has ever stayed at a bed and breakfast probably entertained a thought or two of opening one of their own. It’s a harmless fantasy trotted out every time the job gets too tedious, or the daily commute too long and stressful. Besides, who wouldn’t want to live in a Victorian home (beautifully restored) in a lovely spot like Cape Cod or along Lake Michigan. 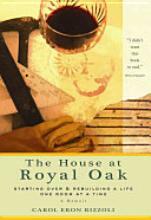 Well, before seeing a realtor about that Queen Anne fixer-upper by the water, read The House at Royal Oak. It may not dissuade you from opening a B&B, but at least you’ll have some idea of what you’re in for. When the book begins, the author Carol and her husband Hugo find themselves at a crossroads. 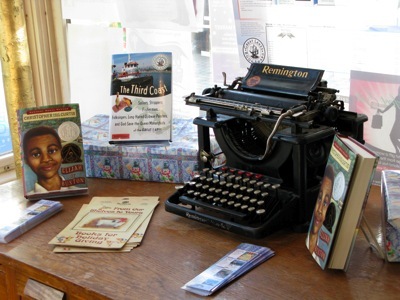 Their children now grown, Hugo had recently been forced to close his long-time bookstore in D.C. Although he went to cooking school afterwards and began to cater, he missed the “daily flow of people, books, and ideas, the sense of place and community that were a good bookshop.” While the author loved her own job editing art books for a museum, she was beginning to suffer from migraines at work. Although family and friends tried to discourage them, both Hugo and Carol realized that “the current path, though known, was one neither of us wanted to continue down.” So after spending two years searching for the right house along the country roads surrounding Washington D.C., they at last came upon a 19th century parsonage on the Bay Hundred peninsula in Chesapeake Bay. A country Victorian house, it was surrounded on three sides by water and close to the small village of Royal Oak. And it was for sale. But closing the sale was not as straightforward as expected. Nor was getting the house in good enough condition to be able to open for business. Little did they realize it would be nearly three years before they could get that fixer upper ready for paying customers. The expense was far greater than anticipated, the repairs more extensive, and the back-breaking work often handled by the owners themselves. Hugo and Carol haven’t hit the seven-year mark yet, so only time will tell if they’re in it for the long haul. But reading about the adventures – and misadventures - in the few years since opening the Royal Oak B&B, they have had ample reason to both regret their decision – and celebrate it. So far they’ve weathered a few rude and dirty guests (though thankfully not many), but as she sees it, “Long after you’re certain you’ve seen it all, know it all, guests will arrive with more lessons to teach about human nature – theirs and yours." And it’s not simply inconsiderate guests one must contend with. As innkeepers, they had to learn to handle hurricanes, poisonous snakes hanging from garden trees, lurking coyotes, gun-toting neighbors, and energy-conscious strangers angry over the inn running too many lights on their front fence. Btw, for those seriously considering opening their own inn, the book provides recipes and lots of useful tips; e.g. to make money an inn needs at least five rooms to rent out. Finally there is an entire chapter titled Eight Good Reasons to Start a Bed-and Breakfast and Seven Bad Ones. So while reading The House at Royal Oak may not prepare you for all the problems and pleasures of innkeeping, it’s a pretty good place to start. Pratchett’s books featuring the Discworld characters are hilarious. I always liked Death in the other books, as well as his “adopted” granddaughter Susan. Curious to learn where she came from, I decided to read Mort. Pratchett's wry humor kills me (ha ha, pun intended) every time. Obviously, "mort" is a play on the French word for death and that intrigued me. Mort (short for Mortimer) needs a profession. No one takes him on as apprentice except Death - and once that happens, Mort is in for the ride of his life. I don't give spoilers because I want readers to pick up the book and enjoy the plot, humor and suspense for themselves. I will say I read this book while visiting Vienna and, despite all the touring we did, I could NOT go long without sneaking in a few chapters until my eyes begged for sleep. It's THAT funny, and I often giggled in places or laughed out loud. Pratchett is one of the best storytellers in fiction, and you can pick up any of his Discworld books and never get lost, whether it’s Guards, Guards!, Wintersmith, or Hogfather (where Death appears to enjoy playing Santa). If you haven’t yet experienced the inventive world of Pratchett, there's no better time to begin.